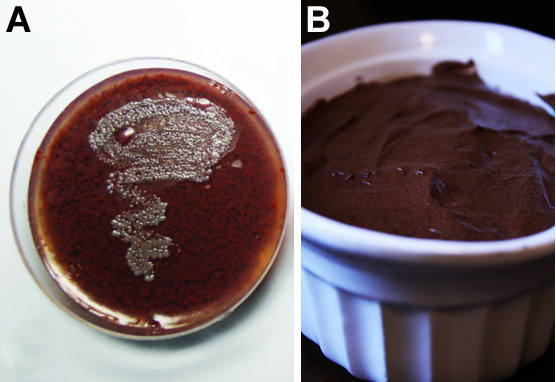 Chocolate agar refers to two very different foods, only one of which actually contains chocolate. Both are prepared using agar, a mixture obtained by boiling certain types of algae to release a sugar called agarose that forms a gel when it cools. Thus agar (also called agar agar) can be used to make jelly desserts, flavours of which include coffee-coconut and, you guessed it, chocolate. It's basically a vegan form of Jell-O (which contains gelatin derived from animal bits). The second type of chocolate agar is also a jelly-like substance, but it's prepared by adding blood (usually obtained from sheep, pigs, goats, or cows) to melted agar, slowly heating it until the blood turns a chocolate brown colour, and then pouring the appetizing mixture into dishes to cool and form a gel. The blood is heated to break open the red blood cells that are found within it. This is important because red blood cells contain delicious factors (e.g. NAD, hemin) that certain bacteria are unable to synthesize on their own but still require for growth. These same bacteria are really bad at breaking into red blood cells, and so will not grow well on agar made with unheated blood. Bacteria that specifically grow well on chocolate agar include Haemophilus influenzae (so named because it was thought at the time to be responsible for influenza, which is actually caused by a virus) and Neisseria meningitidis. Both of these bacteria are found hanging out innocuously in the throats of many healthy people, but can cause potentially life-threatening illnesses such as pneumonia and meningitis in individuals with a compromised immune system or who are otherwise susceptible to infection. Other bacteria that grow well on chocolate agar are responsible for sexually transmitted infections, such as Haemophilus ducreyi (chancroid) and Neisseria gonorrhoeae (gonorrhea). The common theme here is bacteria that like to eat chocolate agar have a longstanding relationship with human beings, and likely lost their ability to make a number of necessary growth factors (found within red blood cells) because they could just grab them from the person they were residing in. Tatusov RL, Mushegian AR, Bork P, Brown NP, Hayes WS, Borodovsky M, Rudd KE, Koonin EV. 1996. Metabolism and evolution of Haemophilus influenzae deduced from a whole-genome comparison with Escherichia coli. Current Biology 6(3):279-291.